ALLENDALE – Ramapo is one of the best public school boys basketball teams in the state this season and even gave Bergen Catholic a game when the two met up in Franklin Lakes a couple of weeks ago, but there is still plenty of work to do. With games getting bigger and the stakes rising, Ramapo is still looking for ways to grow. A lot of the bases are covered with size inside, athletic length on the wings, a steady pass-first point guard and a fifth starter who loves the nuances of playing defense against the opposition’s best player. Senior John Whooley is that fifth starter and he not only understands his role, but wholeheartedly embraces it. So what happens when Whooley steps out of his comfort zone, starts taking the ball to the basket and finishing layups in traffic? 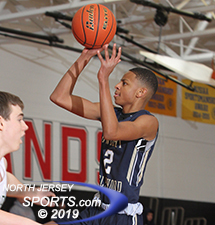 Whooley did more than turn the corner; he paved the way for the Ramapo offense on Saturday in the Round of 16 at the Bergen County Jamboree. Whooley scored 12 of his 16 points in the first half and nailed two three-pointers in the process as the third-seeded Raiders outscored No. 14 Dwight-Englewood in every quarter on the way to a 74-54 victory at Northern Highlands High School. Ramapo will play No. 6 Saddle River Day in the quarterfinals next Sunday at Fairleigh Dickinson University. Dwight-Englewood scored the first two points of the game on a Judah McIntyre layup 23 seconds in to take its only lead of the game. Quinn, the senior transfer from Northern Highlands who will play in the Patriot League at Lafayette next year, tied the game for the only time with a putback of his own missed shot and KC Hunt, Ramapo’s other Division 1 signee (baseball, Mississippi State) scored on a driving layup to make it 4-2 1:06 into the game. From there, the Raiders would never be caught as they scored 14 straight points after falling behind for the lone time in the game. Ramapo led 18-8 after the first quarter and Hunt scored the final three points of the second quarter to break the game open at 38-21 by halftime. There were some chippy moments throughout the game and especially in the second half with the outcome just about decided, but Ramapo kept its cool and was not drawn into any type of retaliation. Senior Neal Quinn scored a game-high 24 points for third-seeded Ramapo, which will face No. 6 Saddle River Day in the quarterfinals on Sunday at FDU. Dwight-Englewood, which has won at least one game in the Jambo in each of the last three seasons, saw the county tournament curtain call for two of the players that have helped the Bulldogs attain that decision. McIntyre went out kicking with a team-high 18 points while senior Jordan McKoy, after a scoreless first half, finished with 9 points. The crew charged with maintaining Dwight-Englewood’s status as a perennial Jambo qualifier, showed out as freshmen Jayden Lemond and David Mager finished with 9 and 8 points, respectively. Harrison Ruff and Sam Lieberman each made three-point field goals and Tyler Koutros made two fourth quarter free throws to round out the scoring for Dwight Englewood. Quinn led all scorers with 24 points and Hunt’s 20 and Whooley’s 16 made it three Raiders in double figures. 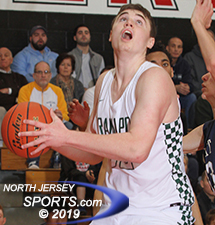 Kyle Hroncich, Ramapo’s senior point guard scored all six of his points in the first half as he team pulled away and junior forward Max Pernetti scored his four points on two third quarter field goals. Senior Justin Hu sophomore Sean Clapp split the other four points for Ramapo, which might have its hands full in the next round against a similarly senior-heavy Saddle River Day team that is currently undefeated and full of confidence.